Welcome aboard—to the fun and adventure of Sea Scouts, a program combining the traditions of the past with the technology of the future. Whether you look to the sea for a career or lifelong hobby, Sea Scouts is for you. To join, you must be 14 years old (or 13 years and completed the eighth grade) but not yet 21. 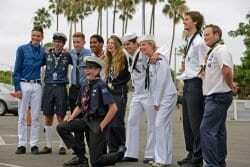 Sea Scout programs are run by the youth members. Elected officers plan and conduct the program. Being part of the vessel’s crew teaches teamwork. As experience is gained, more opportunities arise to contribute to the leadership of the unit. For more information, please contact Chris Macy via email or at (562) 344-1589. Uniforming is an important part of developing program recognition and self-identity. By wearing the Sea Scout uniform, youth make a statement to observers about courtesy, thoughtfulness, honesty, and other core values that convey character. Working on a vessel reinforces the fact that with privilege comes responsibility. The same is true with the privilege of wearing the Sea Scout uniform. Anything done while wearing the uniform reflects upon the reputation of all Sea Scouts in our nation. It becomes each Sea Scout’s responsibility to always do the right thing, and it becomes each Sea Scout’s responsibility to keep the Sea Scout uniform correctly creased, cleaned, and maintained.